My husband and I are waist-deep in water. I press my feet together like claws to grip what feels like a rock, then kick them upward to try and grab my prize. I'm looking for stones at the bottom of Lovewell Pond, where we are vacationing this week. I figure the stones on the pond floor will be smoother and rounder then the jagged and broken ones you can easily collect on the shoreline. My husband dutifully dons his mask and snorkel and goes searching underwater, something I can't do because I might lose a contact and I didn't bring any spares. He resurfaces with another mussel, half-covered in green gunk. "Can you eat them?" I ask, thinking of the delicious steamed mussels in garlic-butter sauce we ate at a hole-in-the-wall seafood shack in Portland years ago. "I don't think so. If you could, people would have taken them all by now." That was true. Free seafood would not be left alone for long. Like coronet-shaped seashells and green and blue seaglass, treasures for the taking tend to go quickly. Look at me--I'm seeking to steal off with ROCKS. Not any rock, but one that is light enough and smooth enough to draw on. It's a project I had seen on Pinterest. As I've mentioned before, that site has sucked up more than its fair share of my free time. I spend more time on that site than I do actually cooking the recipes or making the toilet-paper roll projects that I pin. 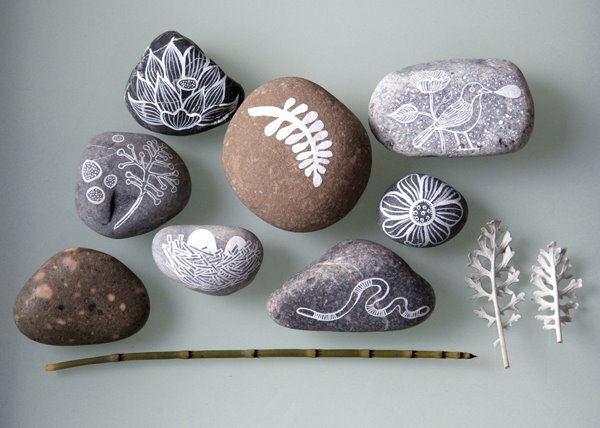 But I am on vacation now and thought I'd try that simple project I had recently pinned of drawing on rocks. It might sound like a stupid way to spend my vacation time, but it was better than going into credit card debt at the nearby outlet mall. Right? There is something in us that seeks to collect. We collect names on our Facebook and LinkedIn pages, foreign cities we've been to, restaurants where we've dined, books and music we like (though sadly as these collections become digitized, they're not as easy to show off to your friends), pictures, even spiritual acumen. It seems that there is never enough in our lives--we're always searching for that next thing to make our collections complete. But this habit of collection comes at a cost: of time, money, living space, and especially peace-of-mind. It's hard to relax and just be content with where you are or what you already own without wondering what else is around the bend. I spend most of my vacations thinking about what I'm going to eat, do, read, buy, watch next. There is little time left for actual relaxation. If I'm lying in the hammock staring at the starlit-sky I'm also half-thinking about the leftover apple pie in the cabin, or what I'm going to do the next day. Even when I sleep I invariably have some kind of consumerist dream where I'm wandering around the same store that I dreamed about the week before. This is surely a first-world problem, but it's still something to stop and think about. My first attempt at rock drawing. Think I'll try using paint next time.